Still, I want to keep the blog going, and I'll definitely make an effort to post at least a few times per week. For now, here's a really simple but delicious dinner idea, perfect for a weeknight. The base is risoni pasta (called orzo in some places - basically it's rice-shaped pasta) tossed with pesto (and an optional spoonful of cream), topped with whatever you like. 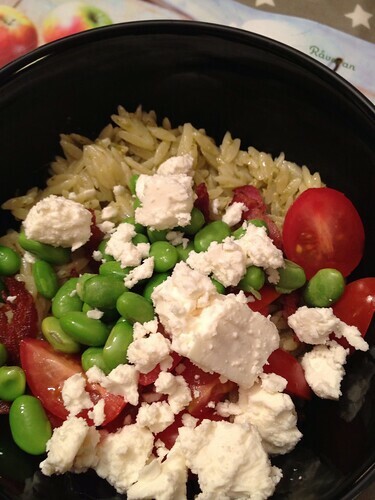 We had tomatoes, edamame beans, and feta cheese. Fried halloumi or bacon are wonderful as well, pickled red onions is another great addition, cubed avocado... Well, it's versatile. And we usually serve everything in separate bowls, so you can mix and match. Congratulations on your great news! I still remember the joys and pain of how pregnancy affects one's desire (or lack of desire) to cook and eat--hope that you feel better soon! Your dinner looks great--I love the different colors and textures!